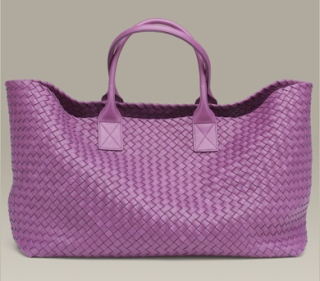 The woven leather handbags by Bottega Veneta are timeless, classy, and chic. If I could only buy one handbag for the next 10 years, it would probably be a Bottega. Woven leather is visually interesting and is a great pattern for leather, but one that won't go out of style. They even do the woven bags in exotics....woven ostrich, anyone? I could not agree more!! This bag is beautiful! let's split the cost.. make it last ten years... totally worth it.